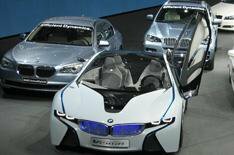 BMW Vision Efficient Dynamics | What Car? The stunning Vision Efficient Dynamics concept car gives a hint at the techonology and styling we can expect from future BMW models. The Vision Efficient Dynamics promises to blend supercar performance with supermini fuel consumption and CO2 emissions. At its heart is an advanced diesel hybrid powertrain.Theres a 1.5-litre, three-cylinder turbodiesel engine mounted just ahead of the rear wheels, with a power output of 161bhp and a maximum of 214lb ft of torque. There are also two electric motors one driving the front axle and one driving the rear. The rear motor normally produces a maximum of 51bhp and is linked to a double-clutch gearbox. The electric motor for the front axle normally produces 80bhp, but can deliver 113bhp for up to 30 seconds and 140bhp for up to 10 seconds. Lithium-polymer batteries are used, with recharging achieved through brake energy regeneration and plug-in technology. BMW claims that the Vision Efficient Dynamics will be capable of supercar-style performance, with 0-62mph possible in just 4.8 seconds and a top speed of over 155mph. Thanks to its hybrid technology and low weight it should emit just 99g/km of CO2, however, and return an average of 75.1mpg. BMW claims a range of 400 miles using just the diesel engine and 31 miles in electric-only mode. BMW says the Vision EfficientDynamics radical styling has been influenced by its F1 experience and is dictated by its lightweight construction and need for areodynamic efficiency. The sleek front end helps to channel the air flowing over the car, with active louvres in the radiators closing completely when the need for cooling is low. The underfloor of the car is fully covered from front to rear, to help it cut through the air as efficiently as possible. The 2+2 interior uses a number of high-tech, low-weight materials, including body-contoured seats with a kevlar shell. If this is the future of BMW, we cant wait for it to arrive.